Arthur K. Wheelock Jr., “Isack van Ostade/The Halt at the Inn/1645,” Dutch Paintings of the Seventeenth Century, NGA Online Editions, https://purl.org/nga/collection/artobject/1188 (accessed April 19, 2019). The vivid sense of daily life that seventeenth-century Dutch artists conveyed in their work is one of that period’s most delightful aspects, and Isack van Ostade was the most important of a number of Haarlem artists who painted rural life at that time. The social area outside a tavern became one of his favorite subjects, providing him the opportunity to combine his skills both as a landscapist and as a genre painter. 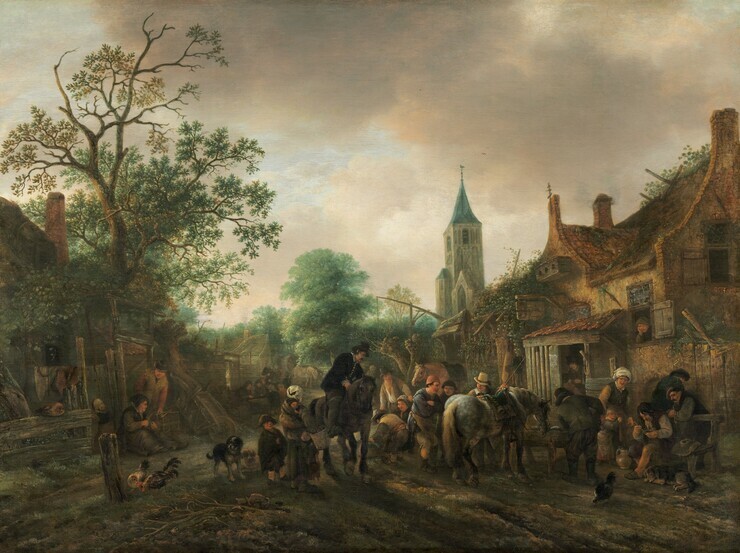 In this painting, we witness the bustle of activity outside a village inn as two well-dressed travelers arrive and dismount from their horses. A woman with a child strapped to her back has stopped to watch, and others converse with the travelers. The street is filled with people, and the informality of all these human interactions creates a sense of conviviality. Van Ostade carefully depicts the timeworn brick-and-mortar construction of the inn and accentuates the charming character of the scene with details such as the vines clinging to the buildings. He exaggerated the level of disrepair to make the structures more picturesque. Such liberties in his painted works are revealed by the drawings he made from life on his treks in the countryside around Haarlem, which clearly show the various inns to be in good repair. A student of his more famous older brother Adriaen van Ostade (1610–1685), Isack died at the young age of twenty-eight. Despite his short artistic career, he had a significant influence on his contemporaries, including Jan Steen (1625/1626–1679), with whom he occasionally collaborated. A replica of The Halt at the Inn, entitled A Village Scene, is in the Wallace Collection, London (inv. no. P21). It is described in the 1992 catalog of the Wallace Collection as a “weak copy.” A plainly clad woman with a child strapped to her back stands to watch while other figures converse with one of the travelers. The main street of the village is filled with other groups, among them, men smoking pipes on a bench before the inn, a child playing with its mother’s apron, and a man talking to a woman who spins yarn. Van Ostade creates a sense of conviviality by the apparent informality of these human contacts and the inclusion of an array of animals within the scene. He added to the picturesque character by emphasizing the aged brick and mortar of the inn and the vines that grow over its weathered tile roof. See F. W. H. Hollstein, Dutch and Flemish Etchings, Engravings, and Woodcuts, c. 1450–1700, 41 vols. (Amsterdam, 1949), 33:18, no. 26; and 34:20, repro. Title pages to these series emphasized that these views were of “pleasant places” in the vicinity of Haarlem and that they were made for the enjoyment of city viewers. Except for occasional depictions of specific inns or ruins, precise locations were of less consequence than the sense of delight one would receive traveling through the landscape and its villages. Country Inn with a Horse at the Trough (Rijksmuseum, Amsterdam, inv. no. A303). While the delight he took in depicting peasant life, already evident in paintings from the early 1640s, may have derived from the inspiration of his older brother Adriaen, this particular subject matter was his own invention. Not only did the varied activities before an inn give him an opportunity to exploit his talents as a genre painter, such scenes also suited his abilities as a landscapist. As is evident from this example, he was particularly adept at depicting landscape elements and atmospheric effects. Part of what makes this scene so vivid are the nuances of light on the buildings and figures that have filtered through the overcast sky and the suggestions of smoke that rise from the inn’s chimney. See Bernhard Schnackenburg, Adriaen van Ostade, Isack van Ostade: Zeichnungen und Aquarelle: Desamtdarstellung mit Werkkstalogen, 2 vols. (Hamburg, 1981), 1:52–54. None of the motifs in the drawings, however, relate specifically to the paintings, which suggests that he used his drawings as a point of departure and freely elaborated on his observations when he came to compose his paintings. Interestingly, the buildings in the painting seem somewhat more dilapidated than those he drew, which indicates that he purposely sought to create this picturesque effect. For the funding of the church’s restoration by Admiral Johan van Duvenvoorde in 1597 and the placement of the weather vane in the shape of his ship, see Kustgids.nl tab Plaatsen tab Bollenstreek tab Warmond, tab Cultureel Erfgoed no. 5: Oude Toren (accessed November 20, 2013). The network of cracks in the paint and ground. Also sometimes referred to crackle pattern. returned, much improving the appearance of the painting. During the restoration it was found that the signature and date, which had read 1645, had been partly reconstructed. Since 1645 seems appropriate for stylistic reasons, this date probably reflected the one originally inscribed on the painting. Marie-Caroline-Ferdinande-Louise de Naples, duchesse de Berry [1798-1870]; (De Berry sale, by Bataillard and Charles Pillet, Paris, 4-6 April 1837, no. 19). Charles-Auguste-Louis-Joseph, comte de Morny [1811-1865, later duc de Morny], Paris; (his sale, Phillips, London, 20-21 June 1848, 2nd day, no. 108). Mrs. Stephen Lyne-Stephens [1812-1894, née Pauline Duvernay or Yolande-Marie-Louise Duvernay], Lynford Hall, Mundford, near Thetford, Norfolk, London (Roehampton), and Paris; (sale, Christie, Manson & Woods, London, 9 May 1895, no. 340); (Charles Sedelmeyer, Paris), in 1895. (Eugene Fischhof, Paris); sold 1898 to Peter A.B. Widener, Lynnewood Hall, Elkins Park, Pennsylvania; inheritance from Estate of Peter A.B. Widener by gift through power of appointment of Joseph E. Widener, Elkins Park, Pennsylvania; gift 1942 to NGA. Reproduced in Charles Sedelmeyer, Illustrated Catalogue of the Second Hundred of Paintings by Old Masters, Sedelmeyer Gallery, Paris, 1895: 34, no. 28. The Hudson-Fulton Celebration, The Metropolitan Museum of Art, New York, 1909, no. 70. The original support was a horizontally grained wood panel composed of two boards joined horizontally just above the grouped figures. A horizontal check extended from the right edge through several of the figures and the head of the brown horse. Prior to 1837, when the painting was in the sale of the collection of the Duchess de Berry, it was transferred from wood to a fine-weave fabric and lined with the dimensions expanded. The transfer canvas has a small vertical tear in the foreground near the gray horse’s tail. In 1982 the lining was removed and the transfer canvas was relined and marouflaged to a honeycombed aluminum solid support panel consistent with the original panel dimensions. The artist incorporated a smooth, off-white ground layer into the light tones of the design. He applied paint in thin layers with minimal impasto. Transparent glazes were laid over opaque layers in the upper sky in the dark foreground. The paint craquelure is characteristic of paintings on both wood and fabric supports, although the solid support mounting minimizes the impression of the weave texture. A thin line of loss exists along the panel join and check and adjacent to a canvas tear that occurred in 1979. Scattered small losses found overall include losses in the signature and date, the beggar woman, and the structures at right. Dark gray stains in the sky were minimized through inpainting when the painting was treated in 1982. Smith, John. A Catalogue Raisonné of the Works of the Most Eminent Dutch, Flemish and French Painters. 9 vols. London, 1829-1842: 9(1842):127-128, no. 17. Catalogue of Paintings Forming the Collection of P.A.B. Widener, Ashbourne, near Philadelphia. 2 vols. Paris, 1885-1900: 2(1900):235, repro. Sedelmeyer, Charles. Illustrated Catalogue of the Second Hundred Paintings by Old Masters, Sedelmeyer Gallery. Paris, 1895: 34, no. 28, repro. Hofstede de Groot, Cornelis. A Catalogue Raisonné of the Works of the Most Eminent Dutch Painters of the Seventeenth Century. 8 vols. Translated by Edward G. Hawke. London, 1907-1927: 3(1910):450-451, no. 37. Valentiner, Wilhelm R. Catalogue of a collection of paintings by Dutch masters of the seventeenth century. The Hudson-Fulton Celebration 1. Exh. cat. Metropolitan Museum of Art. New York, 1909: xxviii-xxix, 71, no. 70, repro., 155, 161. Valentiner, Wilhelm R. Catalogue of a Loan Exhibition of Paintings by Old Dutch Masters Held at the Metropolitan Museum of Art in Connection with the Hudson-Fulton Celebration. New York, 1910: 16, repro. 246, 247, no. 70. Valentiner, Wilhelm R. "Die Ausstellung holländischer Gemälde in New York." Monatshefte für Kunstwissenschaft 3 (1910): 10. Paintings in the Collection of Joseph Widener at Lynnewood Hall. Intro. by Wilhelm R. Valentiner. Elkins Park, Pennsylvania, 1931: 92, repro. Waldmann, Emil. "Die Sammlung Widener." Pantheon 22 (November 1938): 336, 338. National Gallery of Art. Works of art from the Widener collection. Washington, 1942: 6. National Gallery of Art. Paintings and Sculpture from the Widener Collection. Washington, 1948 (reprinted 1959): 52, repro. National Gallery of Art. Paintings and Sculpture from the Widener Collection. Reprint. Washington, DC, 1959: 52, repro. National Gallery of Art. Summary Catalogue of European Paintings and Sculpture. Washington, 1965: 98. National Gallery of Art. European Paintings and Sculpture, Illustrations. Washington, 1968: 86, repro. National Gallery of Art. European paintings: An Illustrated Summary Catalogue. Washington, 1975: 256-257, repro. 257. Schnackenburg, Bernhard. Adriaen van Ostade, Isack van Ostade: Zeichnungen und Aquarelle: Desamtdarstellung mit Werkkstalogen. 2 vols. Hamburg, 1981: 1:35, 274, no. 59, repro. Walker, John. National Gallery of Art, Washington. Rev. ed. New York, 1984: 291, no. 383, color repro. Wheelock, Arthur K., Jr. Dutch Painting in the National Gallery of Art. Washington, D.C., 1984: 16-17, color repro. National Gallery of Art. European Paintings: An Illustrated Catalogue. Washington, 1985: 296, repro. National Gallery of Art. Art for the Nation: Gifts in Honor of the 50th Anniversary of the National Gallery of Art. Exh. cat. National Gallery of Art, Washington, 1991: 72. National Gallery of Art. National Gallery of Art, Washington. New York, 1992: 126, color repro. Wheelock, Arthur K., Jr. Dutch Paintings of the Seventeenth Century. The Collections of the National Gallery of Art Systematic Catalogue. Washington, 1995: 191-194, color repro. 193. Franits, Wayne E. Dutch Seventeenth-Century Genre Painting. Its Stylistic and Thematic Evolution. New Haven and London, 2004: 204, fig. 190. Wheelock, Arthur K., Jr. Gerard ter Borch. Exh. cat. National Gallery of Art, Washington; Detroit Institute of Arts. New Haven, 2004: 60, fig. 1. For a discussion of these prints, see David Freedberg, Dutch Landscape Prints of the Seventeenth Century (London, 1980), 28–38. See F. W. H. Hollstein, Dutch and Flemish Etchings, Engravings, and Woodcuts, c. 1450–1700, 41 vols. (Amsterdam, 1949), 33:18, no. 26; and 34:20, repro. Country Inn with a Horse at the Trough (Rijksmuseum, Amsterdam, inv. no. A303). See Bernhard Schnackenburg, Adriaen van Ostade, Isack van Ostade: Zeichnungen und Aquarelle: Desamtdarstellung mit Werkkstalogen, 2 vols. (Hamburg, 1981), 1:52–54. Abraham Rademaker, Kabinet van Nederlandsche Outheden en Gezichten (Amsterdam, 1725), pl. 81. This tower is the only one depicted by Rademaker that has a central arched window flanked by two blind arches. Distinctive also is the turret attached to its side.